closer to heart | escaped. I find corporate world is an alien concept to my being. But I'm still breathing till today, so I guess things aren't that bad. Getting to the second month is still considered as a transition, right? I envy those who can adapt effortlessly. Or at least, don't have to struggle so much. Believe it or not, I just completed a 70-slide presentation pack and trust me, my final year project is only 20% of that. But the moment I finished it, the overwhelming feeling was unbearable. It's considered as one of my first tasks, the thing that would or wouldn't make a good first impression to my boss' eye, the beginning of what I foresee as my coming routine in this oil and gas business. It's completely different from what I usually do, the past year. And I love that I'm doing something different - far from what I've experienced at other place before, yet closer to my heart. This reminds me that I NEED to blog about work attire. Apparently cardigans are my best friend now. Anyway, I might be gone for two weeks cause I have to attend Petronas Induction Programme for new Executives, or known as PIPE starting tomorrow (I said I might cause I'm bringing my dear laptop too) so wish me luck!! Another round of lectures, LDKs, etc..I thought I left that world already. Pfft. im your newest follower. Feel free to follow back ^.^! 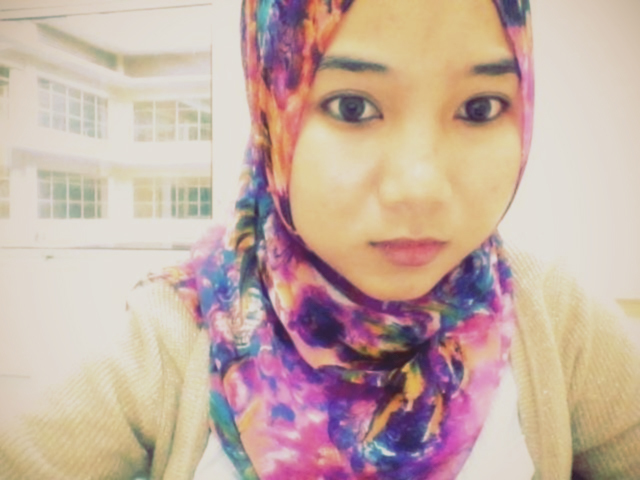 yup, so vibrant that I had to think twice before wearing it to office..hehe.